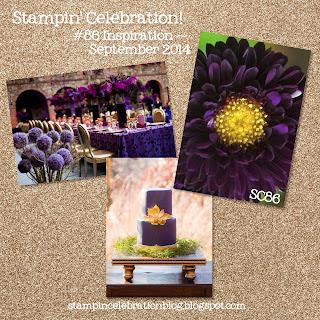 Time for the September inspiration challenge from Stampin' Celebration (SC86)! When I saw these colors I immediately thought of my second child. She loves purple! My sister also loves purple and she is a second child, coincidence?!? I ordered a few of the new products from the Stampin' Up! 2014 Holiday Catalog and decided to use some fun new products! For this card I used Very Vanilla cardstock and stamped the dots from the Dotty Angles photopolymer stamp set (2014 Catalog) using Wisteria Wonder ink. Then I used a feather from the Four Feathers stamp set (2014 Holiday catalog) and stamped it using versamark and then heat emboseed with gold embossing powder. I fussy cut the feather. I used the notetag punch and pucnhed out tags from brushed gold cardstock and elegant eggplant cardstock. Then I cut out a thin strip of very vanilla and stamped the greeting using elegant eggplant ink (Another Thank You photopolymer stamp set, 2014 catalog). I used the notecard punch (2014 Holiday catalog) to punch the rounded edge into the vanilla greeting piece to match the edge. Then I layered these pieces together. I made a fork bow with the gold baker's twine and punched out some small hearts from brushed gold cardstock using the heart border punch. I also took a few of the gold strands from the gold bakers twine out of the twine and added them behind the feather along with a few strands of gold baker's twine. I haven't really used much gold so it was nice to use this color, especially with the purple. Please check out the projects the other Stampin' Challenge designers created for this inspiration challenge! Great ideas from everyone!